This craft is a simple way of decorating your door for the fall holiday season. 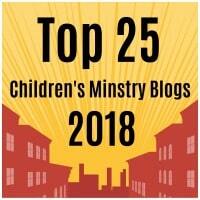 This next step will depend on the age of the child. If the child is young have them glue on the arms and legs to the body of the bear. Then, with two equal length pieces of yarn attach the bear to the give thanks sign. If the child is older he can attach each individual limb, as well as the sign with yarn. Attach a loop of yarn to the top of the give thanks sign to that the craft can be hung on the door. Variation: Instead of gluing or taping the yarn, with a one hole punch, you can tie the pieces together. 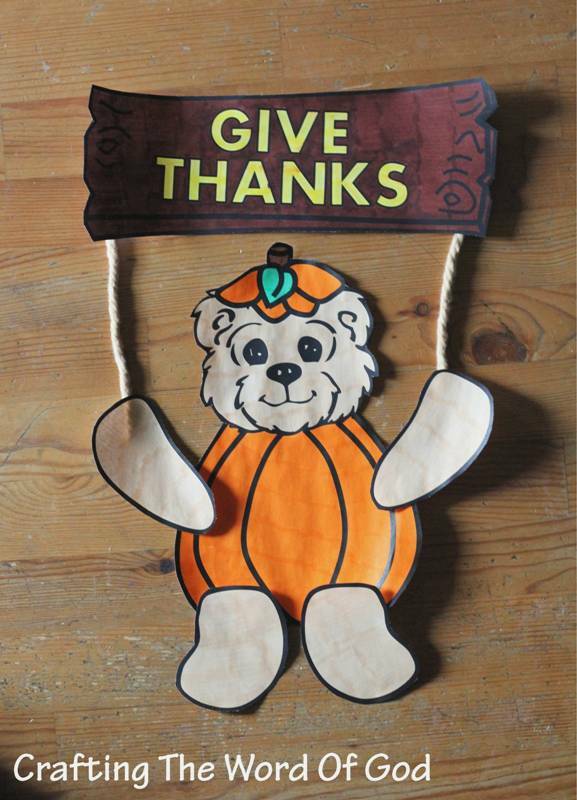 This entry was posted in Holiday Crafts, Thanksgiving and tagged bear, door decoration, door hanger, give thanks, pumpkin, thanksgiving, Thanksgiving sign. A simple reminder for the reason we celebrate Thanksgiving. I decorated the hanger with red circles, but you can use paper leaf cut-outs, Thanksgiving/fall stickers or craft turkey feathers. Decorate the assembled pieces. Again I used red circles, but feel free to use what you have on hand. Color and cut out the pilgrims and the “count your blessings” sign. Glue the pilgrims toward the bottom of the hanger. Finally glue the “count your blessings” sign under the pilgrims. 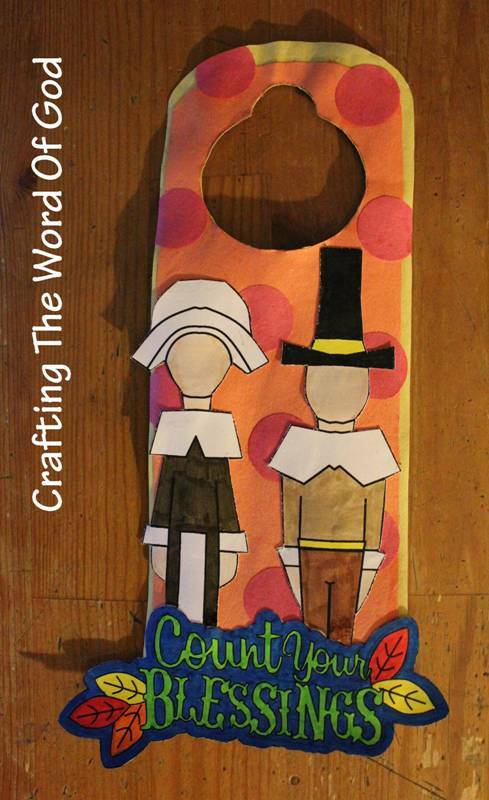 This entry was posted in Holiday Crafts, Thanksgiving and tagged blessings, count your blessings, door hanger, door knob hanger, hanger, happy thanksgiving, holiday, leaves, pilgrims, thanks, thanksgiving, thanksgiving door knob hanger.